Glickman is interim rabbi at Beth Shalom in Baton Rouge this year; the congregation had a launch party for his book’s release on Jan. 30. It is well known that the Nazis had collected hundreds of Torah scrolls they had plundered from synagogues across Europe for eventual museums chronicling what they planned to be the extinct Jewish people. Most people have seen images of Nazis holding book burnings and assume that was what the Germans did with Jewish books. That is also what Glickman thought — until he received a copy of “Hilkhot Alfasi” from an antiquarian book seller in Jerusalem. The book, an explanation of Talmud, became popular when the Talmud was banned by the Pope in the 1500s, but this book escaped the ban. It was one of the first printed Jewish books, and Glickman had ordered a copy of the 10th edition, printed in Bavaria. Inside the front cover of the 18th-century printing of the 11th-century North African work was a decal from a group he had never heard of, Jewish Cultural Reconstruction, which led him to the little-known story of how the Nazis, rather than burning Jewish books, were collecting millions of them and storing them in what became by far the largest library of Jewish books in history. 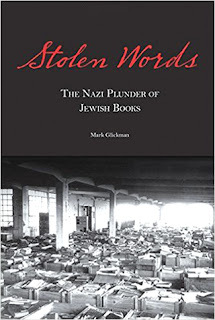 The Nazis “burned books for a short time” when they were coming to power in the early 1930s, Glickman said. Though the “spectacle” was meant as a way for Hitler to show his power, the burnings “got the Nazis really bad press” as they were trying to put on a good image to the world before the 1936 Olympics. Besides, he said, books really don’t burn well — the next day, people would go to the charred piles and retrieve relatively undamaged books from the middle. “In the age of printing, you can’t really burn books” because there are so many copies, he said. After the war, the Allies found many of the book stashes in castles, abandoned mine shafts and warehouses throughout Europe. About 3 million books were brought to Offenbach, Germany, and stored in a warehouse confiscated from the chemical company that manufactured the poison gas used at concentration camps. Efforts were made to reunite books with their owners, after which the rest went to Jewish Cultural Reconstruction. Glickman said noted political thinker Hannah Arendt, who covered the Eichmann trial for the New Yorker, was executive secretary for the group but it is barely mentioned in her biography. The group was little-known elsewhere, Glickman said. There was a dissertation here, a short piece there, but not much else. He researched people who were involved, and tracked down some people who were reunited with their books. One person he included in his book received a children’s book that he never remembered owning, but his name was written inside — he got the book back as an old man. Glickman wrote about how the books were discovered, the process leading to decisions on how to get books back to their owners and who had the authority to do so, and what to do with volumes where the owners could not be identified. He said writing the book was “daunting” because so much has been written about the Holocaust. It is a “challenge to say something new” about that era. What happened to the books is “secondary, a tangential story to the central story, which is the murder” of millions in the Holocaust. This is Glickman’s second book. “Sacred Treasure: The Cairo Genizah” came out in 2012, discussing the 1896 discovery of over 300,000 centuries-old Jewish documents at the Ben Ezra Synagogue. Before coming to Baton Rouge for this year, he was interim rabbi at Har HaShem in Boulder, Colo. In Seattle, where he served Kol Ami in Woodinville and Kol Shalom on Bainbridge Island. While in rabbinical school, one of his student pulpits was Temple Emanu-El in Tuscaloosa.